This entry was posted in Layers, Linetypes. Bookmark the permalink. I’d like to offer an additional tip: The system variable MEASUREMENT controls which linetype file to use (yeah, there are TWO). If MEASUREMENT is set to 0 (“zero”), then AutoCAD uses the ACAD.lin file (for Imperial drawings), and if MEASUREMENT is set to 1 (“one”), then it uses the ACADISO.lin file (for metric drawings). If you have a drawing where the linetypes aren’t scaling properly, it could be that someone either set MEASUREMENT incorrectly, or, they use an Imperial vs. Metric template by accident. 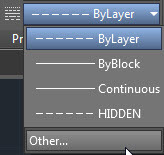 If you need to fix the drawing, set MEASUREMENT accordingly, and then simply reload the linetypes.